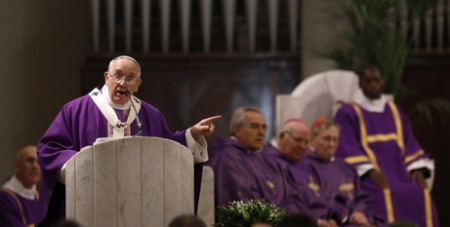 A series of essays in the semi-official Vatican newspaper is urging the Church to allow women to preach from the pulpit at Mass, a role that has been reserved almost exclusively to the all-male priesthood for nearly 800 years. “This topic is a delicate one, but I believe it is urgent that we address it,” Enzo Bianchi, leader of an ecumenical religious community in northern Italy and a popular Catholic commentator, wrote in L’Osservatore Romano. “Certainly for faithful lay people in general, but above all for women, this would constitute a fundamental change in their participation in church life,” said Mr Bianchi, who called such a move a “decisive path” for responding to widespread calls — including by Pope Francis — to find ways to give women a greater role in the church. Two nuns also contributed articles in the special section that is part of a new L’Osservatore Romano series on women called “Women-Church-World”. In her column, Sr Catherine Aubin, a French Dominican who teaches theology at a pontifical university in Rome, noted that Jesus encouraged women to preach his message of salvation, and she said that throughout church history there have been many extraordinary women evangelists. Women today also lead retreats and in effect preach in other ways, she argued. If it happened, such a change would be a controversial shift. In the early 13th century, as part of the movement toward consolidating church power in the papacy and the clergy, Pope Gregory IX effectively barred lay people — both men and women — from preaching, especially on theological or doctrinal matters that were considered the province of educated clerics.